One of my earliest movie memories is seeing the James Bond films Thunderball and You Only Live Twice on a double feature in a theater with my parents. So I imprinted on the character at an early age. 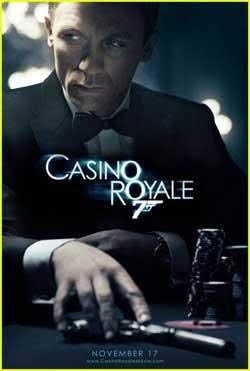 The filmmakers' other main aim with Casino Royale was to give the character some emotional resonance. In this department, too, they have done a good job. The question is whether they will be able to carry this over into the next films. Perhaps another problem with the Bond films in recent years was the need to raise the stakes so high that their plots became too unbelievable and two-dimensional. While they made for good popcorn movies, they disappeared from one..s mind quickly after leaving the theater. The Bond films that hold up the best for me are the ones that are the most grounded in reality: for these reasons, From Russia With Love and For Your Eyes Only tend to rank among my favorites (along with the early Bond films like the above mentioned Thunderball and You Only Live Twice when the series was on the cutting edge of coolness and chic). Casino Royale falls into this category as well, with Bond dealing with terrorists. While I was fairly confident there was little doubt that Bond would continue to entertain audiences well into the 21st century, the future of the series seems to be in good hands with Craig.